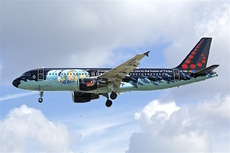 An Airbus A320 operated by Brussels Airlines sustained damage to the nr.1 engine during an incident at the gate at Lisbon's Portela de Sacavém Airport, Portugal. The airplane operated a round trip from Brussels, SN3815/6 at the time of the incident. The aircraft landed at Lisbon International Airport runway 03 and received instructions from ATC to taxi to stand 114. The parking stand is equipped with an automatic guidance system, known as APIS (Aircraft Positioning and Information System), a laser-based technology, which identifies and guides the aircraft to stop in the correct point corresponding to the aircraft type. The APIS system did not identify the aircraft, and failed to give information to the pilot to stop at the position corresponding to the type of aircraft (A320). - Failure of the APIS system at stand 114 to recognize the aircraft. - Unsafe operation by the captain. - Failure of Marshaller to assist the aircraft parking operation. - Operation at a critical stand without guidance from a TOA. - Pilots did not recognize the failure of APIS. - Loss of situational awareness of the pilots at the time of the aircraft parking. - Lack of CRM of the pilots, who did not made the briefing prior to the descent as provided in their operations manual, making the operation unsafe. - Brussels Airlines company didn't create a decision item (“go - no go”) regarding the procedure to follow in case of APIS fault. - NAV Portugal published land charts with errors in the terminal building plan drawing at stand 114.